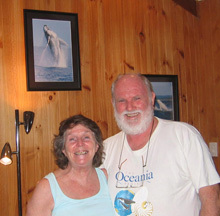 Trish and Wally Franklin run a whale conservation group in Byron Bay, Australia called Oceania. Fifteen years ago, they set out to study the humpback whales of Hervey Bay, a protected inlet on the southern end of the Great Barrier Reef. 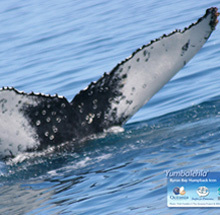 The Franklins spend four months each year with the whales in Hervey Bay. They also run several different educational outreach programs with the goal of protecting the whales. I visited the Franklins at their home, and I asked Trish what prompted her to devote so much of her life to whales and dolphins. She said that initially she had been inspired by a story a friend told to her about a mythic journey with dolphins. She said, "I have devoted so much of my life to Cetacea because I cannot envisage a world without them. The planet would suffer one of the greatest losses in all of human history, and would have to live with the weight of the void left in their absence." Trish Franklin is not alone in her feelings, as the Franklins have discovered through their years of work with the humpbacks of Hervey Bay. One of the interesting things about humpback whales is that their tail flukes have unique markings on them that make it possible to identify individuals. The Franklins helped to start the Humpback Whale Icon project that has encouraged towns and communities on the east coast of Australia to adopt a whale of their own, picking an individual from the Franklins' catalog of images and tracking its history through the couple's annual expeditions. Many towns wanted to adopt an unnamed whale so they could name it themselves, Trish said. Before she studied whales, Trish had studied Australia's aboriginal people, and she was pleased that the communities were contacting aboriginal groups in their areas to find a name from their languages. Many of the first people had whale myths or dreamings - even, according to Trish, people who did not live near the coast. The Franklins have been amazed at how popular the Icon project has become. Some of the communities have asked their town councils to write to sister cities in Japan to tell them how much the whales mean to them. The Japanese whaling fleet could end up killing a town's adopted whale once the humpbacks leave Hervey Bay on the annual migration to their Antarctic feeding grounds. Wally Franklin claims that most Japanese people don't know about the Japanese government's whale-killing program and wouldn't condone it if they did. As for the issue of cultural whaling, while Japan did have a traditional coastal whale hunt at one time, the modern Japanese whaling fleet is fully industrialized. "The Japanese never did pelagic or deep ocean whaling before World War II," he said. But in Japan, as in the rest of the world, the culture is changing. Most Japanese don't eat much whale meat any more, and whale watching has become quite popular. Japan makes more money from whale watching tours than it does from selling whale meat. Some former whale hunters have already transitioned to work as whale watching guides. According to the Franklins, the real reason why Japan is being so "provocative" about its whaling program has much more to do with larger fisheries issues than with a cultural desire for whale meat. The Japanese government is worried that if they concede on the issue of whales, tuna could be next. The tuna fishery worldwide is in collapse. Tuna stocks have declined by 90 percent over the last 100 years. Out of those remaining stocks, Japan takes about 30 percent of the annual catch. The Japanese have a huge need for marine life because it is part of their staple diet. As fisheries continue to decline, Japan is in a precarious position. Wally Franklin said, "Japan has brought its fisheries problem to the table of the International Whaling Commission. They have abused the process. The real issue for Japan is fisheries, and whales are just a red herring - excuse the pun. The Japanese see an advantage in keeping whaling under discussion." Love for whales may take different forms in different cultures. An Eskimo hunter may pray to the spirit of the whale he kills to feed his family. An American child may pray that a lost mother humpback and her calf make their way safely out of the Sacramento River and back to the ocean. A town in Australia may pray that the Japanese whaling fleet does not take the community's adopted icon. But what the Japanese government is doing - using whales as a pawn in an international resource dispute, seems to have no connection with either love or culture. The Franklins have found that their campaign to save whales is growing wildly and organically. Trish described a recent slide show presentation to kindergartners. "The teachers quieted the children and told them, 'now don't you speak unless it is to ask a question.' But as soon as it got dark, they started talking, saying things like: 'I've been a whale.' 'I've been swimming with whales.' And they kept talking about their imaginative experiences, either in dreams or just their imagination of what they knew about whales and dolphins. We hardly got to make our presentation, they had so many stories." Trish Franklin has more than 35,000 photographs of whales and hundreds of hours of video. Because "so many children have never seen a whale," the Franklins are involved in a new project that will make these archives available to the public. Their son Mark, who is a sound and video engineer, is editing the video into short clips. The project is called iWhales. My favorite clip is called "The Girl and the Whale." It is a lovely meditation on interspecies communication. The reason I love whales and want to see them protected is because they themselves have language and culture. They are fellow sentient beings, and the planet would be lonelier without them. Trish Franklin left me with one last story about humpback whales, and an image, which I share with you here. I would raise this one image of the journey of these great sentient beings to those who hunt down whales and kill dolphins with no understanding of the connectedness of all life. Imagine a female humpback reaching the age of sexual maturity. She is five to six years of age. Her name is Yumbalehla (meaning "always on the move" - an Australian Northern Rivers Aboriginal word). Yumbalehla travels with her fellow humpbacks from the icy waters of Antarctica to the warm waters of the Great Barrier Reef lagoons, where she and all of her group were born. She is returning home. Yumbalehla has had many years of training to reach this important stage in her life. Her mother was successful in giving birth to Yumbalehla, in feeding her fat rich milk at the cost of her own health, in training Yumbalehla to learn how to breach and lob-tail, to be so in tune with her mother that she learns to remain still at her side in the presence of male humpbacks and learns to slip over her mother's back away from danger, as she too will need to train her offspring in the coming years. Yumbalehla travels in silence past Byron Bay, the most easterly part of Australia. She knows the journey well through the teachings of her mother and the group as a whole. Turning in a northeasterly direction around Byron Bay, she heads towards the Great Barrier Reef to mate. Yumbalehla willingly takes on the challenge of mating and her eleven-month pregnancy. Knowing now all the dangers of shark nets along the coast, and the presence of orca further off shore, she remains steadily vigilant until she reaches her destination. She is aware that she will need to conserve her energy during the 10,000-kilometer migratory journey from the Barrier Reef breeding grounds to the Antarctic feeding grounds before returning to give birth. Will Yumbalehla have a successful pregnancy? Will she be able to avoid the shark nets or other forms of entanglement from man-made fishing equipment? Will she make it back down to the great southern ocean to feed on swarms of krill, fattening herself up in readiness for the return journey home to her birthing place? Yumbalehla has heard tell of a further threat. She has heard tell of the threat of the intent once again of her kin being hunted and killed. "It's only fifty of her kind," they say. "What impact will killing a few humpbacks have on her kind?" Yumbalehla travels in silence, listening to her kin singing the dreaming tracks to and from the southern ocean. She continues her life's journey, "always on the move." The loss of Yumbalehla would be a human tragedy, disconnecting us still further from life. The challenges that Yumbalehla faces every moment of her life, and the threats to the survival of her kin and culture, continue to engage my attention in raising awareness about whales, dolphins and their ocean environment. Kelpie Wilson is Truthout's environment editor. Trained as a mechanical engineer, she embarked on a career as a forest protection activist, then returned to engineering as a technical writer for the solar power industry. She is the author of Primal Tears, an eco-thriller about a hybrid human-bonobo girl. Greg Bear, author of Darwin's Radio, says: "Primal Tears is primal storytelling, thoughtful and passionate. Kelpie Wilson wonderfully expands our definitions of human and family."